If you’ve packed up your tent until next spring, you might want to reconsider. Winter offers families another season — and another world — to explore through camping. 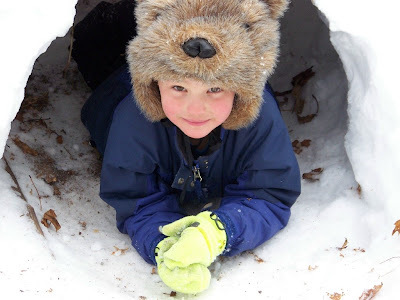 Children may enjoy the wonderfully paradoxical nature of winter camping even more than most adults. It’s cold, but you are warm. There’s the immensity of the world outside the tent and coziness of the world inside it. Even winter’s basic elements, snow and ice, are paradoxes: delicate enough to melt in your hand, strong enough to bear the weight of a tent, frozen substances that insulate you on the most frigid nights. These wonderful and strange properties may be why children need little encouragement to play in the snow. The challenge for parents is to make sure winter camping is comfortable. However, if you follow a few simple rules for safety and start slowly, you won’t find it hard to create warm family memories out of cold winter nights. Start close to home. In fact, Yemaya Maurer and Lucas St. Clair, authors of the AMC Guide to Winter Hiking and Camping, recommend starting at home. If you introduced your children to summer camping by setting up a tent in the yard, you’re already familiar with the benefits of the backyard approach. Trying clothing, sleeping bags, and gear within view of home gives you an easy escape if a child gets cold, wet, or scared — not to mention a nearby bathroom. Don’t forget to build snowmen and snow forts, too: Playing in a familiar way in the snow, Maurer and St. Clair remind us, gives children a basic level of comfort about being outdoors in the winter. Choose close-in favorites. For first winter camping outings with children, Maurer and St. Clair recommend returning to familiar places, preferably those within a mile of a road. Children will be fascinated by the changed feel of a trail they know in other seasons, while you’ll have the extra comfort of knowing where you are. Expect to travel much more slowly on snow than on a dry trail, and remember that daylight starts later and ends earlier in winter than in summer. Check on seasonal road closures and trailhead parking before heading out. Practice layering. Keeping warm and dry is the key to successful winter camping trips, and the key to staying warm and dry is layering. Children need to be taught to wear several layers of clothing that retains heat but not moisture— no cotton — and then need to practice adding layers before they’re cold and taking layers off before they sweat. Try on all clothes at home before packing them on an overnight trip. You want to know ahead of time that last year’s long underwear no longer fits, or that the zipper on that jacket doesn’t work. Once on the trail, stop regularly to monitor young children’s feet and hands for cold (inspect for blisters while you’re at it) and check that inner layers aren’t wet. Pack extras, and make sure children change out of soggy clothes when you reach camp. Enlist children in setting up camp. One of the secrets of winter camping is how much like child’s play it is. Children can help shovel out snow benches and tables, stomp out tent sites, and fill containers with snow to melt into water. Arrive in camp early in the day so kids aren’t too tired, hungry, or cold to join in. Keep it safe, and keep it fun. The standard advice about outdoor activities with children is never more true than for winter activities. If you help children stay warm and dry throughout a winter camping trip, they’re likely to enjoy themselves. And if they’ve had fun in the snow, fun in the tent, and fun coming back out, they’ll probably want to go winter camping again — with you. Purchase the AMC Guide to Winter Hiking and Camping by Yemaya Maurer and Lucas St. Clair. “Great Kids, Great Outdoors” is an AMC Outdoors blog written by Kristen Laine.